Welcome to the sweet world of the Petits Dodos. 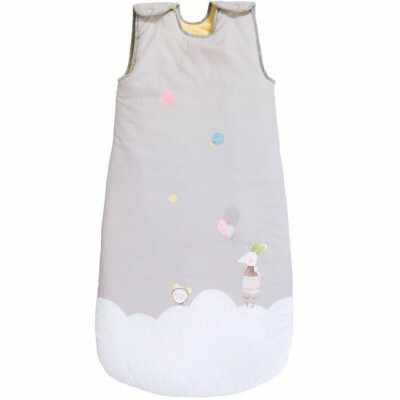 This delicate sleeping bag will ensure a peaceful night's sleep. It features on a grey background Nine the mouse and the alarm clock from the collection standing on clouds, little stars and colourful balloons. Two press studs on the braces allow to open and close this beautiful sleeping bag. Soft materials to wrap up cosily your baby while sleeping. Dimension: 90 cm. In cotton and viscose. Delicate wash at 30 degrees, no tumble dry. From birth.